Each disease topic presented in question format: What is the most likely diagnosis? What is the best initial test? What is the most accurate diagnostic test? What is the treatment? 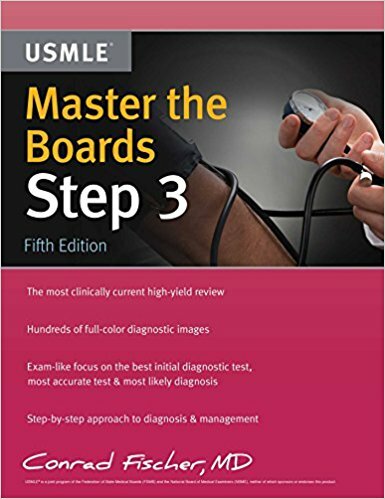 Fully updated to the 2019 exam, Master the Boards USMLE Step 3 helps you identify highly tested concepts, sharpen recall, and recognize the most likely answer on the test. With exclusive test-day tips and targeted review from USMLE expert Conrad Fischer, MD, this full-color review book ensures there are no surprises on test day. "What is the most likely diagnosis?" "What is the best initial test?" "What is the most accurate test?" "What is the best initial therapy?" "Which physical finding is most likely in this patient?" Time-saving outline format includes testable material only. Diagnostic images and tables make information memorable with visual references. Exclusive test-day tips highlight frequent questions and incorrect answer choices to avoid. Sidebars summarize key points for quick review. Keep your studying focused and high-yield with the ultimate MCAT study guide. This comprehensive guide includes all of the most important facts, figures, formulas, and concepts you need to master the new MCAT in a single, accessible volume. Use it to guide your study sessions so you focus on what's most important, quickly find the information you need, and keep track of what you've covered. Ethics questions are included in Steps 1 and 3 of the USMLE, as well as on the American Board of Internal Medicine Examination and other specialty board certification exams. Practical and approachable, Medical Ethics for the Boards provides a concise yet comprehensive review of topics students are most likely to encounter on the test. A chapter of questions and answers provides practice for exam day and helps readers feel prepared. This book includes chapter-level coverage of patient autonomy; competence and the capacity to make decisions; informed consent; confidentiality and medical records; end-of-life issues; reproductive issues;organ and tissue donation; reportable illnesses; HIV-related issues; STDs; malpractice; the doctor-patient relationship; abuse, gifts, and physician-assisted suicide; workplace relations; and ethical issues in research and experimentation. Created by bestselling author and lecturer Dr. Conrad Fischer, Internal Medicine Correlations & Clinical Scenarios provides an entertaining and comprehensive review of internal medicine topics on the USMLE Step 3. Progressive clinical cases--embedded with meaningful foundational science correlations and CCS exam tips--ensure that you're prepared for the new USMLE Step 3. How prepared are you for the new USMLE Step 3? Are you worried about answering questions on basic science concepts? Uncertain about managing the clock in CCS cases? Unprepared to answer questions on pediatric topics? This book is the balm. Created by bestselling author and lecturer Dr. Conrad Fischer, Dr. Elizabeth August, and Dr. Niket Sonpal, Pediatrics: Correlations & Clinical Scenarios provides an entertaining and comprehensive review of internal medicine topics on the USMLE Step 3. Progressive clinical cases--embedded with meaningful foundational science correlations and CCS exam tips--ensure that you're prepared for the new USMLE Step 3. How prepared are you for the new USMLE Step 3? Are you worried about answering questions on basic science concepts? Uncertain about managing the clock in CCS cases? Unprepared to answer questions on general OB-GYN topics? This book is the balm. Written by Dr. Elizabeth August and bestselling author and lecturer Dr. Conrad Fischer, Obstetrics & Gynecology Correlations & Clinical Scenarios provides an entertaining and comprehensive review of OB-GYN topics found on the USMLE Step 3. Progressive clinical cases--embedded with meaningful foundational science correlations and CCS exam tips--ensure that you're prepared for the new USMLE Step 3. Created by bestselling author and lecturer Dr. Conrad Fischer and Dr. Niket Sonpal, General Surgery: Correlations & Clinical Scenarios provides an entertaining and comprehensive review of general surgery topics on the USMLE Step 3. Progressive clinical cases--embedded with meaningful foundational science correlations and CCS exam tips--ensure that you're prepared for the new USMLE Step 3. 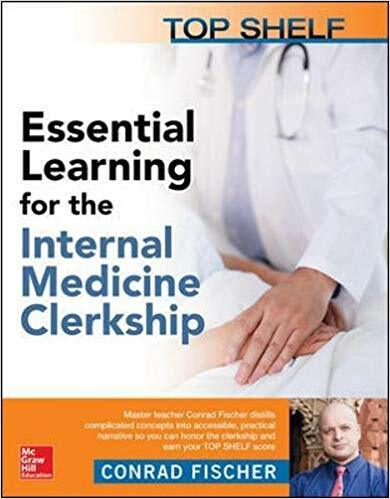 Master the Wards: Internal Medicine Handbook improves your confidence so you can survive the clerkship and ace the shelf. With this in hand, you can arrive prepared on day 1 of your medicine rotation. Written by a residency director who has been a clerkship director--and once, long ago, a med student just like you!--this handbook presents a core set of diseases and disorders from the point of view of how patients present, and teaches you how to assess patients beginning with their chief complaints. The perfect way to master the wards and review for shelf and USMLE/COMLEX exams –150 surgery cases in a convenient flashcard format! Created by Niket Sonpal, MD, and Conrad Fischer, MD, noted educators and bestselling authors of numerous test prep resources, Master the Wards: Surgery Flashcards is a boxed set of 150 expertly crafted study flashcards that help students master high-yield topics and sharpen their clinical decision-making skills so they can excel on the boards, shelf exams, and wards. Produced in full color with clinical photos and designed to conveniently fit into a lab coat pocket, each flashcard includes a clinical vignette and Q&A on diagnosis, physical findings, tests, and treatment. Master Tips highlighting frequently tested items help you stand out on rounds. Created by Niket Sonpal, MD, and Conrad Fischer, MD, noted educators and bestselling authors of numerous test prep resources, Master the Wards: Pediatrics Flashcards is a boxed set of 200 expertly crafted study flashcards that help students master high-yield topics and sharpen their clinical decision-making skills so they can excel on the boards, shelf exams, and wards. Produced in full color with clinical photos and designed to conveniently fit into a lab coat pocket, each flashcard includes a clinical vignette and Q&A on diagnosis, physical findings, tests, and treatment. Master Tips highlighting frequently tested items help students stand out on rounds. The perfect way to master the wards and review for shelf and USMLE/COMLEX exams – 150 obstetrics & gynecology cases in a convenient flashcard format! Created by Niket Sonpal, MD, and Conrad Fischer, MD, noted educators and bestselling authors of numerous test prep resources, Master the Wards: Obstetrics & Gynecology Flashcards is a boxed set of 150 expertly crafted study flashcards that help students master high-yield topics and sharpen their clinical decision-making skills so they can excel on the boards, shelf exams, and wards. Produced in full color with clinical photos and designed to conveniently fit into a lab coat pocket, each flashcard includes a clinical vignette and Q&A on diagnosis, physical findings, tests, and treatment. Master Tips highlighting frequently tested items help you stand out on rounds. What has ruined today’s medical students’ interest in devoting their lives to finding cures for the most rampant diseases riddling our population? How can young doctors not be energized and excited by modern breakthroughs? Why are they not inspired by the ability of current AIDS drugs to increase life expectancy by twenty-five years? In Routine Miracles, award-winning internist and medical educator Conrad Fischer investigates the disconnect between medical advances and the rise of physician dissatisfaction. Fischer surveyed more than 3,000 physicians and interviewed hundreds of patients to uncover the seeds of doctors’ discontent. Based upon his findings, he offers a deeply personal and compelling call to action for all of us, doctor and patient alike, to celebrate the present and the future of medicine. Renowned archaeologist Dr. Steven Carning has been dreaming of discovery. Now, with his team of graduate students he makes the discovery of a lifetime under the Great Sphinx. A hall of knowledge, left behind by an ancient civilization, older than can be imagined and lost to time. Now, as his team is scrambling to understand this fantastic find, Steven undertakes translating the works of this lost civilization. Through this translation, Steven is looking through a window over 13,000 years old, understanding the roots of some of mankind's greatest civilizations. As the story of this lost era of man unfolds for Steven, mysterious forces are also watching with eager eyes, and unknown agendas. The Chronicles of Atlantis: The Age of Immortals is an exciting action tale where our long forgotten past will directly dictate the fate of mankind forever.